TheTownCrier: RINO RUDY corruption on Parade! I HATE elections! RINO RUDY corruption on Parade! I HATE elections! Some people say Rudy will "secure' America! The only judge we have of future behavior is past behavior. Rudy set up emergency command center in the World Trade Center, which was destroyed on 9/11. Hence the breakdown of communications that day. This after it having been hit before and being NY's biggest target. He recommended business partner Bernie Kerick for a cabinet position as head of Homeland Security. But Bernie had some illegal alien nanny problems. 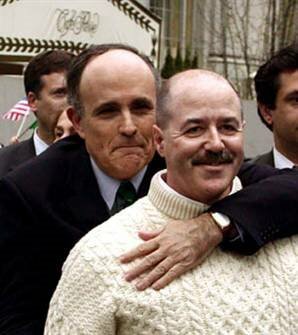 "Kerik had been CEO of Giuliani-Kerik LLC, an affiliate of Giuliani Partners LLC. In a statement Wednesday, Giuliani said Giuliani-Kerik would be renamed Giuliani Security & Safety. Giuliani Partners has advised business and government agencies on security, leadership and other issues. The consulting firm advised Trinidad in its battle against a rise in kidnappings and murders and was paid $4.3 million by Mexico City officials for advice on reducing crime there. " Mexico City!! LOL~! Yeah, RUDY! Bring us that kind of 'security'! While in office Rudy made New York a 'sanctuary' city for illegal aliens, even going so far as suing the federal government to guarantee aliens would not be approached. "Of course, labor law violations are to Big Business what the nickel-a-swear-word jar is to adult visitors to Grandma's house--no big deal. But woe to the political aspirant who doesn't remember the ghosts of Nannygates Past: The law is the law--as Kerik's chief backer, ex-New York City Mayor Rudy Giuliani, observed in reluctantly agreeing that Kerik had to withdraw--or at least it is once the media find out it has been broken. " One thing we would not have to worry about is Rudy being another 'compassionate' conservative. Giuliani was reportedly paid $100,000 to speak for a benefit for Tsunami victims. In a contract obtained by CNN, Giuliani's travel requirements were quite specific. The private aircraft must be a Gulfstream IV or bigger. He didn't end up using them, but also requested in the contract were five hotel rooms, including one for Giuliani, that was to be a large two-bedroom nonsmoking suite with a king-size bed on an upper floor with a balcony and view if applicable.